Row, row, row your bots: But are they synchronized? 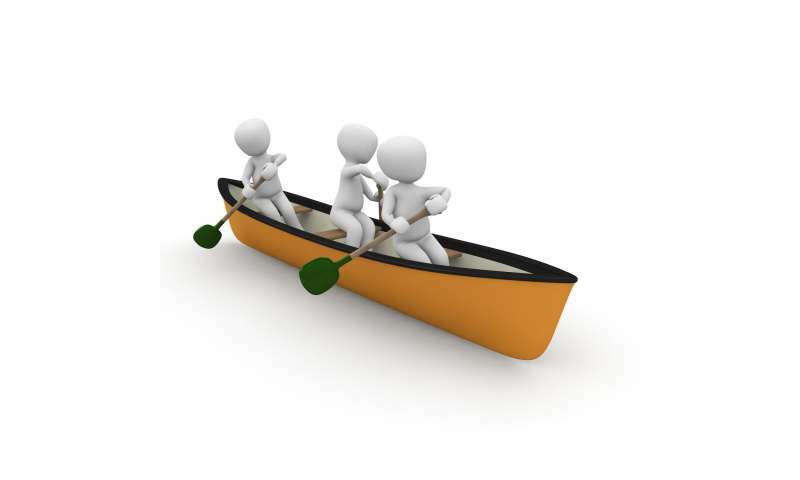 To get maximum propulsion, should a boat's team of rowers set their strokes to the same rhythm? Or should the rowers stagger the dropping and pulling of the oars through the water? Athletes and scientists have looked at the question, offering illuminating but inconclusive observations. But this month's Physics Today features a special article by fluid mechanic researchers at the Paris École Polytechnique laboratory of hydrodynamics (LadHyX), who provide data and fundamental physics approaches for coaches, sportspersons and scientists to keep in mind the next time they observe or get into a crew boat. For their study, conducted in the pool of the École Polytechnique, the LadHyX researchers built a 2-m-long boat with eight robotic rowers and controlled the speed and phasing of the strokes; Physics Today has posted two of their runs online. Scientists, too, have been intrigued in various ways. In a 2010 study of shrimp krill movement, a Georgia Tech team found that this migratory marine denizen maximized its per exertion velocity by staggering the rhythmical flexing of its five pairs of legs. History aside, these researchers wanted to come up with a clear sense of whether rowing in sync, or not, is better for speed. Their experimental boat is one-tenth the scale of a competitive race boat with a realistically shaped fiberglass hull. They compared the synchronous rowing run with trials in which they varied the stroke speed and phase relation of the eight robotic rowers. In addition to measuring the overall speed, the LadHyX researchers determined velocity fluctuations. Read "Row bots" for free in this month's Physics Today to find out what the LadHyX found about synchronous and krill-like desynchronized rowing for raceboat competitions. Nice non-article. "Please click the link" is not an article. Eh, yeah, well. At least the link is free to read. And it brings up an interesting question. The authors concluded that synchronous rowing is a bit faster than asynchronous rowing, then attributed that to the synchronous surge of the hull resulting from the synchronized backstroke, where the rowers' bodies are moving rearward, propelling the hull forward. That makes no sense. The movement of masses back and forth is identical whether the rowing is synchronized or asynchronized. You would expect a higher peak velocity from the synchronized backstroke, but the gain would be lost on the power stroke as the rowers all move their bodies forward. It should be a wash, just from a mass movement standpoint. I'm wondering if the authors missed something. Peak velocity is higher with synchrony, so the hull may be doing something different to temporarily reduce friction.